The Stroller Activity Pals from Fisher-Price easily attaches to most stroller canopies. It has been developed to enhance sensory and gross motor skills whilst providing fun entertainment your little one. 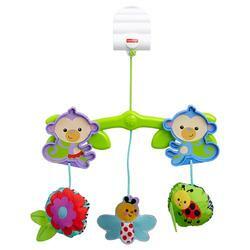 Gross moter: Reaching and batting at the overhead bugs and flowers helps baby develop gross motor skills.